“This will be President Obama’s life work." 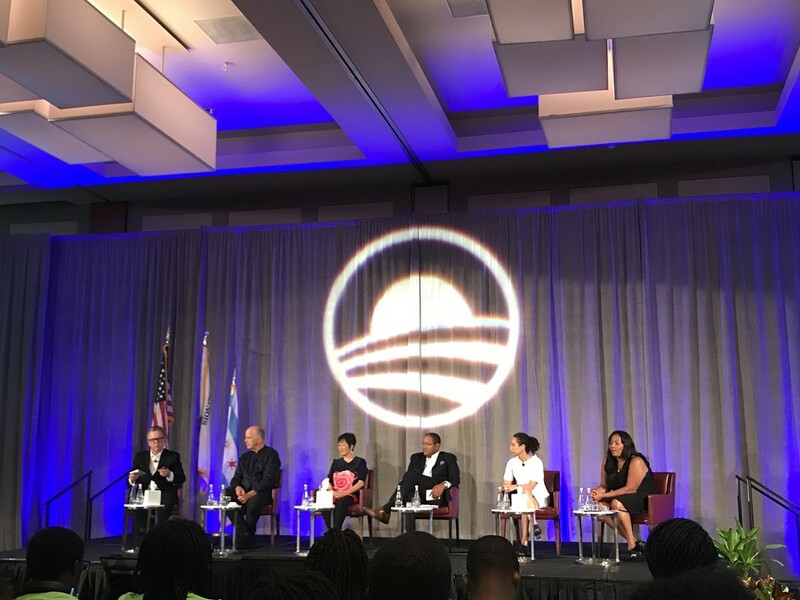 Representatives of the Obama Foundation pitched the planned Obama Presidential Center Thursday night to attendees of a large community forum, many of whom travelled to McCormick Place from neighborhoods near the project’s location in Jackson Park, as a transformative project that would bring many positive changes to the South Side. Joined on stage by lead architects Tod Williams and Billie Tsien, presidential center museum director Louise Bernard, and lead landscape designer Michael Van Valkenburgh, Obama Foundation Vice President of Civic Engagement Michael Strautmanis described how important the project was for the former president. President of WVON Radio Melody Spann-Cooper, who co-chairs the Obama Foundation inclusion council and opened the event, said that the center will be the most significant project on the South Side since the construction of the Dan Ryan Expressway. “It was change. It was controversial. It stirred emotion. But in the end it brought innovation, became and remains one of the busiest expressways in the country, and became the gateway to Chicago’s black middle class. It was transformative,” she said. While many of the residents who were in the room adore Obama and believe that the Center has the potential to bring positive change to their communities, there is significant concern that a development boom could gentrify neighborhoods, forcing-out longtime residents. Reginald Jackson, a renter in the South Shore neighborhood, told The Maroon that though he thinks his rent will go up and he knows that property taxes are a significant concern for some, he’s optimistic the project might bring more grocery stores with healthier food to South Shore, and he hopes that the Foundation will pursue initiatives like partnering with health clinics and the University of Chicago Medicine to combat health disparities for African Americans. "Rent is going to up, but you want to make sure it doesn't force out people who've lived in the neighborhood for years,” he said. Marsha, an Englewood resident, said she’s excited for the development, and though she understands concerns about rising rents, she has a lot of trust in the Obamas. Strautmanis stressed the Foundation’s commitment to having the expected 5,000 construction jobs go to South and West Side residents, noting that the Foundation has asked for proposals on diverse hiring practices from the four firms vying for the “privilege”—as he referred to it—to build the center. A group of about 20 activists, who want the Foundation to sign a written agreement that would legally bind the center to providing benefits for surrounding communities, camped overnight outside the Hyatt Regency McCormick Place hotel, where the event was held at a ballroom inside, to make sure the first question for Foundation officials was about a community benefits agreement (CBA). Obama made a surprise appearance via video conference for a portion of the event, which gave Woodlawn resident Jeanette Taylor the opportunity to challenge the former president to explain why the Foundation has said it won’t sign a CBA. Obama spoke for a minute or two about the Foundation’s commitment to the community in general terms, without specifically addressing a possible CBA, when Strautmanis tried to move on to the next question. However, Obama stayed on the subject, and addressed the CBA directly. The husband-and-wife team of architects showed images of the proposal and spoke about the principles guiding the design. “It certainly is the greatest project we’ll ever work on in our lives so it means everything to us,” Billie Tsien said. They said the center’s main tower is shaped to model four cupped hands coming together, as pictured in this slide. Lead landscape designer Michael Van Valkenburgh addressed the plan to remove sections of Cornell Drive, which has raised concerns about traffic among local residents. “Cornell Drive of course has been a thing in this process, but the removal of that is going to give us an opportunity to do something that we’ve heard from some of you which is that the lagoon currently feels separated from the edges of Jackson Park on the West Side because of the width of the highway, and so the removal of that will give us a chance to make the lagoon feel more visually accessible,” he said. Asked after the event about the University of Chicago’s involvement in the planning of the Center, Strautmanis only said that the University is a “partner” before directing The Maroon to a representative of Kivvit, a public affairs company, who did not immediately return a request for comment. In comparison with the George W. Bush presidential library, for example, which is located on the campus of Southern Methodist University and has a strong collaboration with the University, the University of Chicago has said it has largely been hands-off with the Obama library.